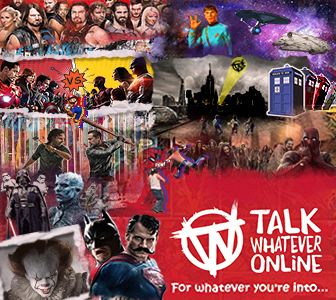 The purpose of the Talk Whatever Online (TWO) is to provide a forum for cult entertainment fans to interact with each other in a fun and friendly manor. While we believe very much in the freedom of speech & expression, you DO NOT have an absolute right to say/post whatever you want in this community. Anything that goes against our core beliefs and the purpose for which this community was designed may not be allowed. Posts and comments that are meant to incite conflicts between members or outside parties are strictly prohibited. TWO Administration has the absolute right to edit, modify, close or delete any content found in this community. While this rarely, if ever happens, we will not tolerate individuals or groups creating problems with the overall membership. Abusive comments, flaming, or derogatory insults or comments are strictly against the rules. If you disagree with another member's point of view, do so in a mature and civil manner. If someone posts to discuss their personal problems or seeks help from other forums members, please do not respond unless you have something positive or helpful to add. If you find yourself being flamed or insulted by another member, please do not dignify that person with a response. Notify a Forum Leader and let us handle it. If you feel you must respond to a flame or insult directly, please do NOT do so on the board. Use Private Messaging, but make sure you do NOT threaten any member. Spam posts are not tolerated under any circumstance. Users posting spam will be warned and their post removed. Multiple warnings will lead to suspensions or bannings. This includes the posting of a third party website which bears no relevance to the thread, or messages which serve only to boost a members post count. The administrator and Forum Leaders reserve the right to edit or remove any post at any time. Threads that contain multiple instances of spam may be closed at the discretion of the Forum Leaders. We encourage members to join in with discussions offering you own opinions and life experience. Please do not post messages just to increase your post account. Any messages that are effectively pointless to a discussion topic will be removed. While we understand many of the members are grown adults, we do have young adults and children that visit TWO. Further, many people are offended by vulgar language. If you feel you must swear to get your point across, please censor your language appropriately so as to not be overly offensive. (e.g., "S***!") Replacing one or two letters in an expletive by using ASCII characters (! For I, etc) is not an acceptable solution. Abuse of this rule will lead to your posting privileges being suspended. A maximum of ONE account is allowed per person. We have the ability to track and match IP addresses on accounts. If you are found to be using two or more accounts, one or more of them will be closed/deleted and you may be banned from TWO all together depending on the situation. The bottom line here is to register one account and stick with it. If you have account problems, contact an Admin (Kam) and state the problem you are having. Kam may recommend that you re-register if the problem cannot be solved but in most cases a problem with an account can be corrected. You may not impersonate another board member or create an account for the purpose of provoking other users. This includes creating an account very similar to another member as to confuse others by the similarity in names. Accessing or using someone else's account or attempting to access another member's account is strictly prohibited. Members should NOT post anything on behalf of other forum members (this includes banned members). If a member has something to say, they should post it under their own forum username. Any threads/posts abusing this will be deleted. If you log onto Talk Whatever Online and receive a message that you have been banned, please submit an un-ban request and wait for the admin to get in touch with you. You may NOT re-register under a new name if the software lets you. But, if you try to sign up again and we catch you, then it will become a permanent IP Ban. While we prefer that all content be posted in the forums themselves (unless it is a copyright violation to do so) so our members will always be able to access it, we realize that some information must remain on remote sites as it may be too extensive to re-post. Posting links/URL's in the TWO forums is allowed (NO affiliate links) as long as they substantiate a post, or are summarized. Please don't post links with a comment such as, "Check out this link". Let members know what the link is about, rather than surprising them with it. When posting news/information items, please put the item in quote boxes and always include the source of your information with a link if possible too. We also do not permit the posting of personal email addresses in public forums due to privacy issues. If you want someone to contact you privately, please post a note at the end of your post to be contacted via Private Message (via the forum conversation system) as long as it is a personal issue. The posting of your personal email address in ANY public forum invites SPAM from people creating mass email listings. Believe it or not, there are people who get paid to spend all day searching newsgroups, message boards, discussion forums, and chats just to collect email addresses that are posted. Members may not post personal contact information such as home address, work address, home telephone number, work telephone number, etc., in the public forums. ANYONE, including guests to TWO, can read the public forums - this policy is in place for YOUR safety and protection. If you would like to plug your own site, please do so in the plug forum or in your signature. Please do not create discussion topics in the main forums around your own websites. Will lose posting privileges for 7 days. A repeat offender may be permanently banned from the community. Threads or replies promoting or expressing intolerant views towards "minorities" (race, religion, sexual preference, interracial couples, etc.) will not be tolerated. Consider this the only warning. Violators will be banned. "Trolling" or making posts with the intention of creating problems on the forums is obviously against the forum rules. This includes registering an alternative account for the sole purpose of creating problems on the forums. "Troll accounts" will be locked immediately and permanently, and the primary account holder will be banned from TWO. Members that visit TWO only to participate in "conflict" threads may be designated as Trolling and have their account temporarily or permanently suspended. Talk Whatever Online DOES NOT endorse any legal advice given anyplace within the Talk Whatever Online community. We highly recommend that members and guests get the advice of an accredited legal expert whenever possible and never rely on just one source. Threads/replies encouraging illegal/unethical action will not be allowed. Signatures are currently allowed at Talk Whatever Online but are a privilege that may be revoked if abused. Signatures MAY NOT contain images of any type. "Bumping" a thread is when you make a post for the purpose of making the thread appear on the "View New Posts" option, or light up as forums with new posts do. While there are some circumstances when doing this is reasonable, it should be kept to rare use. If a Forum Leader or Admin feels there is no reason for this, there is a good chance your post will be deleted and you may be warned. Repeated abusers may have their posting privileges suspended. OTP's are posts that do not relate to the original post/topic, or is placed in the wrong category. While we realise threads often expand into different topics, we encourage members to do their best to stick with the original topic, or start another thread. Off-Topic posts are subject to editing or removal at administrative discretion, and without notification. Members that continuously post off topic may have their posting privileges suspended. Please post your topics in the most appropriate forum. If you post a thread that would be more appropriate in another forum, a Forum Leader will move it for you. However, please do not make the Forum Leaders do this for you. Use your judgment to determine which forum best suits your topic. If you are dealing with a topic that could appropriately fit in more than one forum, please pick the one you feel is closest to your topic. As TWO grows, it becomes increasingly important to properly title the subject of new threads. People find the threads that they are interested in mostly by scanning the titles, even when searching with our site search engine. Titles/Subjects that are misleading are not allowed. TWO Forum Leaders may change the title of any thread to assist in describing the content of the thread without notifying the member who started the thread. In some cases, a Forum Leader may also contact the member if it is evident the member is having a problem with titling to give tips. Members are NOT allowed to post links that lead to any type of affiliate program where points are given or any type of prize or monetary value is awarded. Members found to be posting links such as these will have their posting privileges suspended for 7 days. Repeated violations will result in banning. ALL of the general rules listed in this forum apply to the Private Messaging system, especially soliciting, advertising and sexually related PM's. Violating any of these rules in the PM system will result in immediate removal from the community. TWO Forum Leaders and Administrators will move threads & replies to the most appropriate forum often without notice to the member who started a thread. Please spend a little extra time making sure where you start a thread is the best place for it, and don't rely on Forum Leaders to do this for you. Members found to blatantly post threads "wherever" may lose their posting privileges. TWO Administration has the right to close or remove any post or thread we deem inappropriate. The decision to Close or Delete a Post/Thread is solely ours. We have a strict policy of keeping the posts in this community constructive. Posts that create an unnecessary amount of conflict and serve no further purpose may be closed at the Forum Leader's discretion. Further, it is the policy of this community NOT to delete posts unless the information in a post may put someone in jeopardy. It is the members responsibility to think of the potential consequences of the post they are about to make prior to doing so. Removing a post will often destroy readability of the thread by making it unreadable. Deleting the first post in a thread will cause the deletion of the entire thread. Members do not appreciate spending their time responding to posts only to have the post they make disappear, so we make it a point not to delete posts just because people change their mind after making a post. We do not delete user accounts as anyone else could register under the same name again which could cause confusion within the community. It is possible for usernames to be changed and accounts to be closed, but we will not delete any active accounts. Active accounts are those that have made any posts on the forum. If you are having a problem on TWO that you feel you cannot solve by any other means available to you, we invite you to contact one of the Senior Moderators or the Administrator. Administrators have the final say with anything in this community. Please be sure that if you change your personal email address that you do so here at Talk Whatever Online as well. If you lose your password in the future, you will need to have a current and valid email address in your profile to receive the lost password, and verify any changes with the admin.